If some kind of financial difficulty has left you in need of immediate cash, and you have a valuable designer watch that you can use for collateral, you should definitely come see us in our pawn shop store for a watch loan in Mesa, Arizona. We are always looking for some of the best designer watches such as IWC, Panerai, Breguet, Breitling, Patek Philippe, Omega, Cartier, and Rolex, but even if you don’t have one of these name brand collectibles, we may still be able to provide you with the cash you need. Whoever the manufacturer of your designer watch may have been, if the watchband or the case has 14K to 22K gold in its composition, it will have value to us and it can be used as collateral for your loan. How do we Start With a Watch Loan? To expedite the process, you should bring along any paperwork or documentation you have regarding the items authenticity, and if you have the original box, that will also increase its value to us. By you providing these accessories, it will save time that we would otherwise need to verify that it’s a genuine collectible. When you bring any of the fine watches described above into our shop, its authenticity will first be established, and the precious metal content will be determined, then our in-house expert jeweler will give it a thorough appraisal, and determine what its actual cash value is on today’s market. Is Selling a Watch a Better Option? 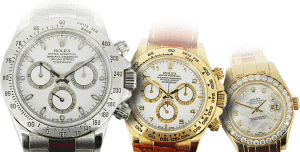 You don’t even have to sell the watch to us outright in order to receive a large cash payment, since we can assume temporary ownership of the watch in a pawn arrangement, while you are given the cash you need to get past your financial crisis. We would then write up a pawn agreement which will specify the amount of interest and principle that needs to be paid for the life of the agreement, and at the end of that time, you would again resume ownership of your collectible watch. For any of the months that you are unable to pay the full amount of the agreement, you can keep the pawn arrangement in effect and in good standing by simply paying on the interest, as required by Arizona state law. When you are again in better financial condition, you can pay down on the principle as well, so that eventually you can reduce your outstanding balance to zero, and again take ownership of your watch. Is There a Limit to Designer Watch Brands for a Watch Loan? Even if you have a very expensive designer watch that had an original sale value of thousands of dollars – and in the case of some of the best Patek Philippes, over $100,000 – we can still probably advance you the cash you need for your short-term financial problem. What we would like you to remember is that you will always get the best prices and the highest payouts here at our watch store in Mesa, Arizona, so if you have a fine designer watch that you’d like to convert into fast cash, remember our store first before you go anywhere else.